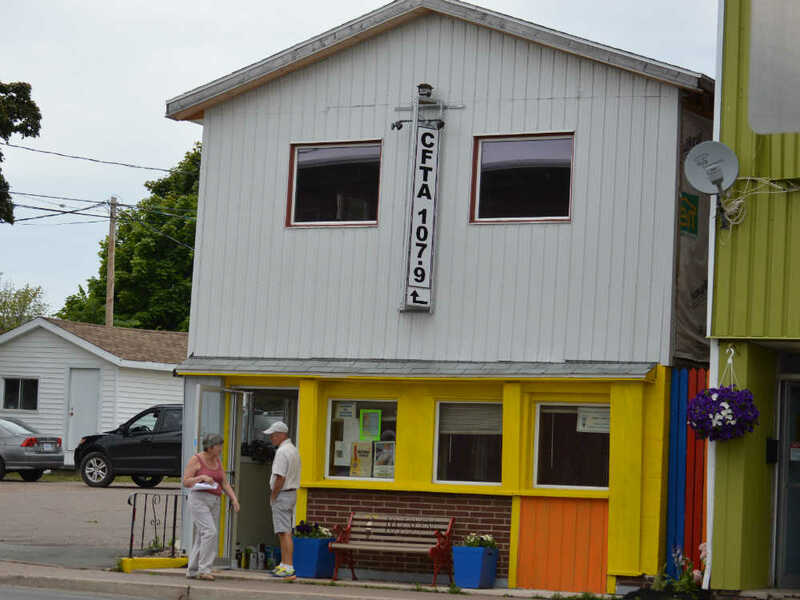 The word eclectic is in their mission statement, so it’s no wonder I got a kick out of Tantramar FM. The sign on the side of their building caught my eye as we drove through Amherst on our first day in the area. I like to know what’s up with local news and weather, so I flipped the truck radio to 107.9 FM, and it stayed there — and on the cottage radio — for a week. The characters on the radio became my new friends, surprising me with classic rock on the way to the beach, hillbilly tunes while preparing dinner, then a little light jazz over cocktails (by “cocktails,” you understand, I mean a local beer while I barbecued). I was by turns bemused, taken aback, and reduced to delighted giggles. CFTA 107.9 FM became such a fun part of our trip that Trevor and I stopped to take pictures of the building on our way out of town. Trev urged me to go inside to talk to them, but I was, as always, overcome with shyness. The best I could do was tell a guy standing outside the station that I was just a fan of the station and not being creepy wandering around taking pictures. I felt kind of creepy, though, so I took some shoddy, badly framed pictures and dodged back to the car. I had just started pulling away when he came up to the driver’s side window. His name was Mike. He had eyes the colour of the sky just after the clouds clear, and he was wearing a tweed newsboy cap and white button-down shirt. He had the barest of Maritime accents and was clearly passionate about music. Though he’d sounded almost dismissive when I’d asked if he worked here, it became clear within seconds that the station is a big part of his life. He turned on tour-guide mode, waving broadly at the vinyl-sided building. He led us confidently inside and introduced us to the ladies at the front desk before ushering us toward the sound booth. He never stopped giving us information and anecdotes, though in hushed tones, and pointed to screens in the sound booth to explain how the announcer knew he had two minutes and eight seconds before he was back on air. “There’s an antique bingo machine,” he said, pointing into another small sound booth. “That’s for radio bingo.” Then through to a recording studio and two other little rooms, one for archiving, and the tour of the lower floor was almost done. As he led us back down the hallway, he tapped the red light outside the main sound booth. Mike got more excited as he took us upstairs. He’d helped build this extension and he was clearly proud. It was clean and open and bright up there, with a large rectangular table under a wall painted with “Music is life. That’s why our hearts have beats.” The small green stage on the street end of the extension came from their old building, and it looked like it was dusted with the sounds of a thousand stories. I think Mike would have told us half those stories if he’d known where to start. CFTA’s head of sales, Beverlee Estabrooks, told me over the phone that it was probably Wilson Moore (“He breathes bluegrass”) or Randy Geddes, who just bought a church where local bands can play. His son’s part of the music scene, too, Bev told me. We listened to a wonderful and strange travel show recorded while the hosts were on the road. Knowing dead air is death for radio, the hosts did their best to narrate during a slow drive through Minudie: “Oh, look over there. A Saint-Bernard is pooping on the grass.” We weren’t able to squeeze in a trip to Minudie despite the sights. Tantramar FM is just five years old, but was the result of five years of planning. During a major ice storm, Bev said, a former announcer from another local station tuned in to find out what was going on and what sort of services he could get. But that station was fully automated, leaving him quite literally cold. He and two colleagues set out soon after to start a truly community radio station that would broadcast important information during power outages, storms and other emergencies. The rest of the time “we just have a lot of fun,” Bev said. The station is non-profit and teams up as often as it can with church groups, the cadets, Lions, local artisans, and other groups. It extends its to hand to community members who want to try out radio to see how it fits. Some record at home, others come in to test-drive the recording studio. A group of students is working hard on a series of ghost stories, Bev said, that will include the mystery of Esther Cox — a story I was going to tell you. But I’ll wait and leave it to the kids. It’s 12:44 p.m. where I’m at. If you’re reading this on the Internet, I don’t know what time it is, because I don’t know where you are.